The Prop Pal Needle System is a genuine piece of equipment thought of and designed by a builder, for builders. 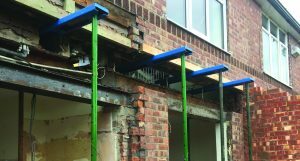 The patented system is a revolutionary new propping method which delivers on all fronts. Designed to do things a better way, designed to do things safely, designed to do things professionally. Needle is passed through hole (in wall) from inside to the outside with the swivel plate resting it can be positioned and fixed to the floor. Builder’s prop is inserted and pinned at required location to allow the winding up. Prop and needle can be wound up to support the masonry. (Ideally position needles at 900-1000mm centres). The Prop Pal needle is designed so that a builder’s prop location into the needle is locked in position once it has been wound up. At the other end the swivel plate has 4 holes where it can be fixed to the floor boards securing it in position. Proof tested to 1500kg load. The needle is manufactured from HR4 steel and has been proof tested to a safe load capacity of 1500kg. To achieve this capacity means that it was proof tested to 3000kg with no deflection. So a safe load of 1500kg is well within its capability. For Sale :- Please Enquire.